HCA206 specificity ELISA using various antigens as coating reagents. Human anti-Adalimumab antibody (HCA206) was used as the primary antibody followed by an HRP conjugated anti-His tag antibody as a detection reagent. 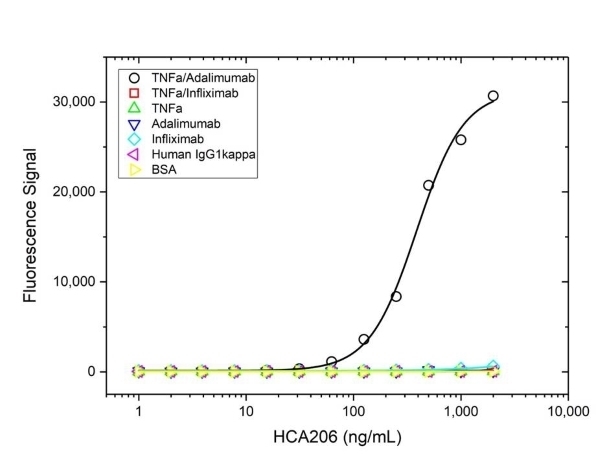 HCA206 Antigen-Capture Assay using the Adalimumab/TNFα complex binder HCA206 for detection. 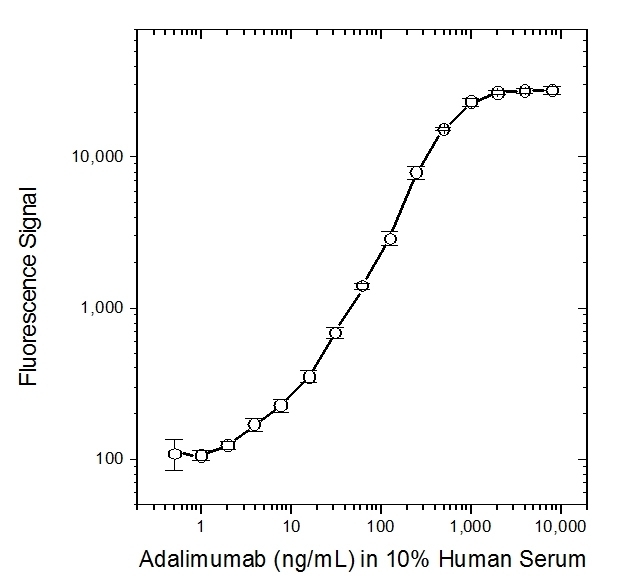 Human TNFα was used as the coating reagent followed by Adalimumab spiked into 10% human serum. Human anti-Adalimumab/TNFα antibody HCA206 (conjugated to HRP) was used as the detection reagent. HCA206 specificity titration ELISA. Various antigens (black: TNFα/Adalimumab; red: TNFα/Infliximab; green: TNFα; dark blue: Adalimumab; light blue: Infliximab; pink: human IgG kappa and yellow: BSA) were used as coating reagents. 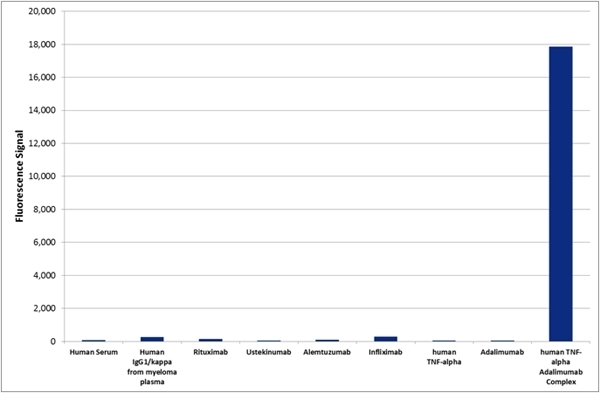 For the antigen complexes, either Adalimumab or Infliximab was then added. Detection was performed using HRP-conjugated HCA206 in a dilution series. Anti-adalimumab drug-target complex antibody specifically recognizes the adalimumab-TNF alpha complex exclusively and detects adalimumab or biosimilars only when bound to TNF alpha. This antibody is in monovalent Fab format and is suitable for a PK antigen capture format assay. Human anti Adalimumab, clone AbD18754, is an antibody that specifically recognizes the adalimumab monoclonal antibody while complexed with TNFα. As clone AbD18754 is a complex-specific antibody that recognizes adalimumab bound to its target, TNFα, it does not recognize either free adalimumab or unbound TNFα. Clone AbD18754 can be used in assays to measure adalimumab that has been captured via immobilized TNFα. It can also be used to measure adalimumab, TNFα and biosimilar products using bioanalytical assays. Adalimumab (branded as Humira®) is a fully human monoclonal antibody (IgG1/kappa) approved for the treatment of ankylosing spondylitis, Crohn’s disease, psoriasis and several forms of arthritis. The antibody is specific for TNFα, and acts by blocking the activation of TNF receptors by TNFα. This inactivation down-regulates the inflammatory reactions associated with autoimmune diseases. A monovalent human recombinant Fab (kappa light chain) selected from the HuCAL® phage display library, expressed in E. coli. The antibody is tagged with a DYKDDDDK tag and a HIS-tag (HHHHHH) at the C-terminus of the antibody heavy chain. This antibody is supplied as a liquid. The monovalent intrinsic affinity of this antibody was measured as KD=67 nM by real time, label-free molecular interaction analysis on immobilized adalimumab/TNFα complex. Humira® is a registered trademark of Abbott Laboratories. This product may be used in an indirect ELISA on Adalimumab/TNFα complexes or as detection antibody, when conjugated to HRP, for Adalimumab bound to TNFα. Harth, S. et al. (2019) Generation by phage display and characterization of drug-target complex-specific antibodies for pharmacokinetic analysis of biotherapeutics.